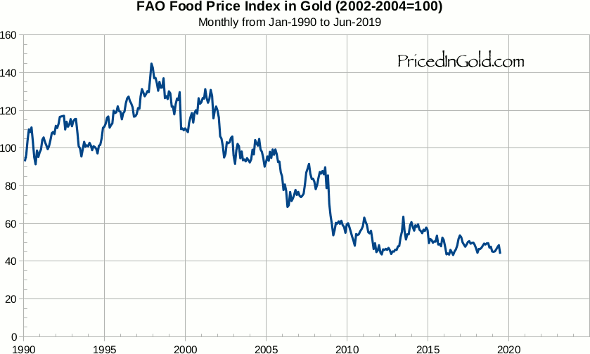 The UN Food and Agriculture Office tracks prices of food around the world, converts local prices to US Dollars, and calculates an index with 100 being the average for 2002-2004. Prices for meats, cereals, oils/fats, dairy and sugar make up the components of the index, which is updated monthly. Of course all the currencies used to quote these prices are being depreciated by their governments, just as the US dollar is. And as this depreciation accelerates, so do the apparent "rises" in the cost of food. But is food really getting more expensive? Of course not! Technology and capital are being applied to reduce the cost of growing and shipping food everywhere in the world, every day. As pests are controlled, machinery makes agriculture more efficient, and world markets make more bounty available to everyone, prices fall naturally. Of course bad weather, bad government policy and other problems can create short term shortages, but over all, prices have been falling for a long time, and show no signs of reversing. As you can see on the chart below, they have just bounced off their record lows! 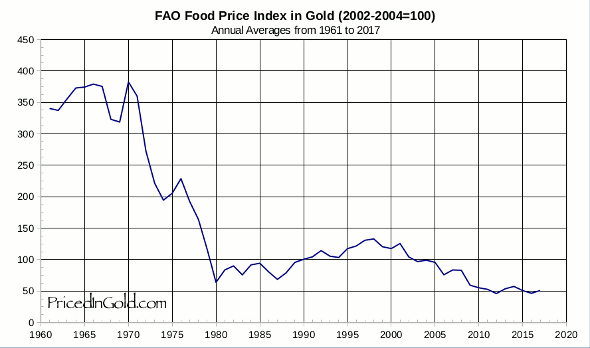 What ishappening though, is that governments are destroying the purchasing power of money, making prices appear to rise, and making it hard for families to gather enough of the rapidly depreciating stuff to buy the food they need. Expect this trend to continue for years to come.